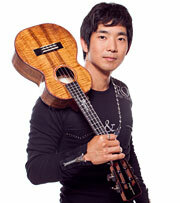 In his young career, ukulele wizard Jake Shimabukuro has already redefined a heretofore under-the-radar instrument, been declared a musical "hero" by Rolling Stone, won accolades from the disparate likes of Eddie Vedder, Perez Hilton and Dr. Sanjay Gupta, wowed TV audiences on Jimmy Kimmel and Conan, earned comparisons to Jimi Hendrix and Miles Davis, and even played in front of the Queen of England. This spring, he will be featured as the focus of a new PBS documentary titled Life On Four Strings. Please join us as we welcome Shimabukuro to the Clive Davis Theater for a unique evening event highlighting his musical dexterity on the uke. Hear Shimabukuro in discussion about his amazing collaborations, his recent 30 + city tour and his latest album, the critically acclaimed Grand Ukulele. Following the discussion, Shimabukuro will take audience questions and will instruct a short demonstration focusing on ukulele technique. The event will be moderated by moderated by Vice President of the GRAMMY Foundation and MusiCares, Scott Goldman.